If you’re not sure about a particular item, just get in touch to check before you travel. Remember, this list doesn’t cover absolutely everything, but it’s a good guide to what you can and can’t take with you. Anything that’s inherently dangerous or that could be used to commit an act of violence or threat will not be allowed. If our security teams have any concerns about an item that they believe might represent a risk, Eurostar reserves the right to remove or refuse that item. • Unlicensed firearms, including replicas and de-activated firearms. Imitation or toy guns that have the appearance of a genuine weapon. • Ammunition of any calibre and in any quantity. • All explosives: military shells (including war souvenirs and relics), detonators, smoke cartridges, grenades, mines, explosive military stores, imitation devices, fireworks, flares, pyrotechnics. • Items containing incapacitating substances such as gas guns, tear gas sprays, mace, CS gas, phosphorus, acid and other dangerous chemicals that could be used to maim or disable. • Any quantity of inflammable substances, including empty canisters e.g. petrol,methylated spirits, paint thinners. Don’t worry though, you can take nail polish and hairspray. • Firelighters and lighter fuel. • All flick knives, gravity knives and daggers. • Folding/lock pocket knives with a blade over 3" (75mm) in length are also banned. Smallfolding pocket knives with blades under 75mm are the exception and are permitted. • Any other weapon made, adapted or intended for use as an offensive weapon. • Alcohol in excess of our alcohol policy. • Any item of furniture. • Perishable items such as meat, fish and dairy products. • Authorised firearms not requiring a certificate, e.g. compressed gas or air powered match pistols or hand guns. • Licensed firearms: a firearms certificate will be required and a European Firearms Pass may be required. You’ll need to check in advance with the relevant national authorities in the country of boarding and destination. Note that all ammunition must be removed. • Swords (ceremonial and real). Sword sticks and umbrellas containing a sword blade. Swords for fencing. • Ceremonial weapons such as kukri or skeandhu, martial arts weapons, crossbows, crossbow bolts, longbows and arrows, starting pistols. • Dangerous sporting equipment (see sporting equipment section). • Open razors and cut-throat razors. • Kitchen knives and household utensils. • DIY tools such as screwdrivers, drills and hammers. If you’ve been to visit one of the commemorative First World War sites, you’ve probably noticed that you can buy certain military relics from this era as souvenirs. Keep in mind, though, that certain items on offer are, for safety and security reasons, strictly prohibited from travelling on a Eurostar train. In accordance with Article 215 of the French Customs Code, you’ll be at risk of arrest, prosecution and a substantial fine if you attempt to travel with any historical weapons, munitions or explosive devices, either within your luggage or carried on you. 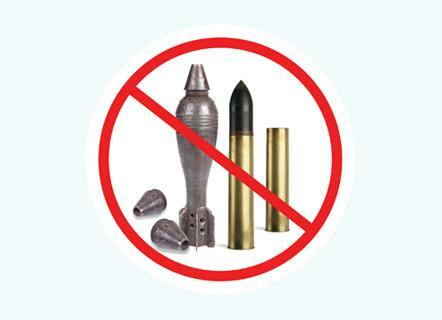 Such restrictions are also applied to carrying military shells and cartridges (even if they appear to be empty). These items are a potential danger to yourself and all others in the vicinity where they’re carried. They have also been the cause of frequent station evacuations and significant travel delays when detected. We will also disregard any certification from sellers of such items claiming that they have been de-activated and are therefore harmless. The police will deal with each detected item in the same way. Travelling with €10 000 or more? No problem, but declare it to customs before entering or leaving the EU. This also applies to equivalent in other currencies or assets.